Institutions are the stuff of social and economic life. The importance of understanding the role of institutions in economic growth is now widely appreciated. 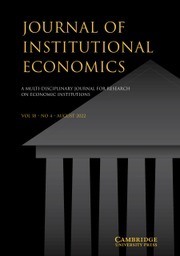 The Journal of Institutional Economics is devoted to the study of the nature, role and evolution of institutions in the economy, including firms, states, markets, money, households and other vital institutions and organisations. It welcomes contributions by all schools of thought that can contribute to our understanding of the features, development and functions of real world economic institutions and organisations. The Journal of Institutional Economics is an interdisciplinary journal that is of interest to all academics working in the social sciences, particularly in economics and business studies. Contributions from politics, geography, anthropology, sociology and philosophy are also welcomed. The Journal of Institutional Economics aims to provide all authors with an expert verdict on their articles within fifty days of submission.